We believe the Holy Bible was written by men supernaturally inspired by God and what they wrote is truth without any mixture of error in its message and in every word and is therefore the only complete and final revelation of the will of God to mankind. We believe that the Scriptures have been preserved pure and whole through the centuries in the Greek Received Text and the Hebrew Masoretic Text. We believe the King James Version to be the Word of God in the English language. II Peter 1:19-21, II Timothy 3:16-17, Psalm 12:6-7, Psalm 119:160, John 12:43. 2. Of the True God. We believe there is one, and only one, living and true God and that in the unity of the Godhead there are three persons, the Father, the Son, and the Holy Spirit. Exodus 20:2-3, I Corinthians 8:6, Ephesians 4:6, John 4:25, Luke 1:30-35. 4. Of the Virgin Birth. 5. Of the Holy Spirit. 8. Of the Fall of Mankind. We believe that the salvation of sinners is wholly by the grace of God; through the mediatorial work of the Lord Jesus Christ who by his death on the cross made a full and vicarious atonement for the sins of every person. Therefore, there is salvation only in Christ Jesus. We do not agree with the doctrine of limited atonement. Ephesians 2:8-9, Acts 15:11, Romans 3:24-25, John 3:16, Hebrews 9:12-15, Acts 4:12, I John 2:2. 10. Of Grace in the New Creation. 11. Of the Freeness of Salvation. We believe that the church is the spiritual body of Christ. 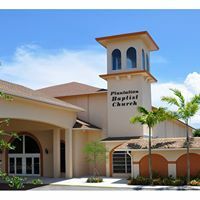 A local church is a congregation of baptized believers associated by the common faith and fellowship of the gospel; observing the ordinances of Christ; governed by His Word; and exercising the gifts, rights and privileges invested in them by His word; that its officers of ordination are pastors (also called bishops or elders) and deacons; we believe that the true mission of a church is found in the great commission, Matt. 28:19-20; we hold that a local church is autonomous with the absolute right of self government; and that the one and only superintendent is Christ through the Holy Spirit; that it is scriptural for churches to co-operate with each other in contending for the faith and for the furtherance of the gospel; that every church is the sole and only judge of the measure and method of its co-operation; on all matters of membership, of polity, of government, of benevolence. Acts 2:41-42; I Cor. 11:2, Eph. 1:22-23; Eph. 4:11; Acts 14:23; Acts 6:5-6; Acts 15:23; Acts 20:17; I Tim. 3:1-7; I Tim. 3:8-13; Matt. 28:19-20; Col. 1:18; Eph. 5:23-24; I Peter 5:1-4; Acts 15:22; Jude 3-4; I Cor. 8:23-24; I Cor. 14:1-2; I Cor. 5:11-13. 14. Of Baptism and the Lord’s supper. 15. Of the Eternal Salvation of the Saints. 16. Of the Righteous and the Wicked. 17. Of the Resurrection and Return of Christ to Earth.